To conclude March, let’s begin a series on “Plants of the North” to coincide with UBC Botanical Garden’s education theme this month, “Biodiversity of the North” as part of the International Year of Biodiversity. 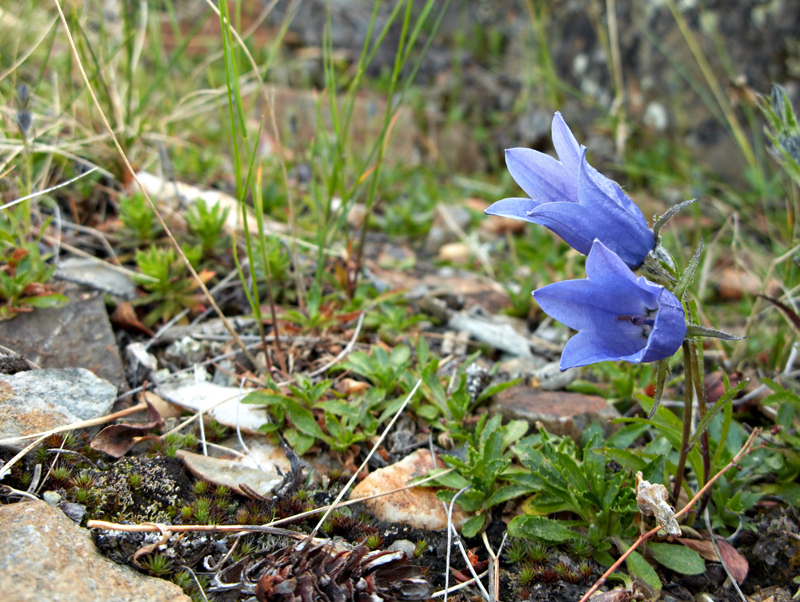 Mountain harebell is a species of northwestern North America and northeastern Asia, with its range extending as far south as Washington (where it is a “State Sensitive” species) in North America, and Hokkaido, Japan in Asia. I spotted these particular plants northwest of Dawson City while traveling the Top of the World Highway. A rocky outcrop caught my eye while driving, so I decided to explore it by scrambling up the 50m or so to the top. Campanula lasiocarpa is one of the few species I found still in bloom in early July. This diminutive perennial reaches a maximum height of 15cm (6in) tall, a feature common to many arctic or alpine plants–the short growing season of arctic-alpine areas rarely rewards height. On the other hand, flower size is relatively large, perhaps 1/5 of the height of the plant. What is the rust on the leaves? Puccinia campanulae Carmich. ex Berk. has been reported from Campanula lasiocarpa. Beautiful little flower. Thank you for sharing. Enjoyed the story of finding them as much as the great photo. Exploring new places and finding the unexpected is one of life’s great adventures!